Since 2001, Epsilon Iota, a former chapter of Alpha Tau Omega, has existed at American University as something of a wicked folk tale, hidden behind a dark, unsettling shroud. Yet, the dangers of this “underground fraternity” are very, very real. After the University officially disbanded EI in February of 2001, the organization has continued to operate in the shadows. The group infamously came under fire in 2014 after a series of leaked e-mails indicated they had long fostered a culture of drug use and sexual assault off campus. Before that, two of its members attempted to run over a fellow student with a car--an incident that resulted in both head and spinal injuries to the victim. Now, nearly 17 years after the chapter’s dismissal, the administration has finally struck EI with a punishment appropriate to their crimes. AU announced the expulsion of 18 students, while disciplining another for their involvement in the unrecognized organization. After a misconduct investigation and an appeals process, the University concluded they indeed violated an amendment to the Conduct Code and finalized their decision. While The Eagle is fully in support of the University’s decision, we would also like to acknowledge that there is much more left to be done. The dismissal of the 18 offenders is just a small step down a path that AU should have started long ago. Although this sets a serious precedent for the future of such cases, EI remains a heinous threat not only to students, but to the integrity of Greek life at American. Freshmen arrive at AU not knowing the dangers of associating with EI. When students receive warnings from the administration through e-mail, they often ignore them. But when they come from sources outside the administration, students will take heed. RAs and PAs need to be alerting their residents of the risks involved in attending EI hosted events, especially for freshmen. Counterproductively, to focus on their parties is also to publicize them. Rather, The Eagle urges AU to spotlight the real dangers at work here. EI’s history must be made known, and it must be told now. This is a 17-year old-problem and only the beginning of a solution. 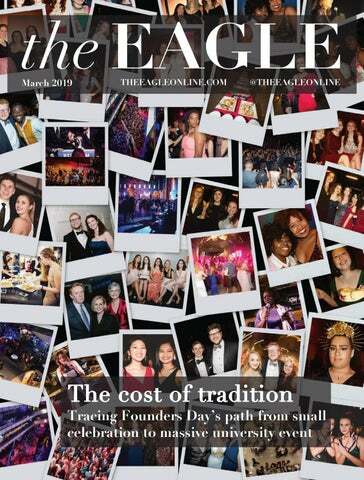 The Eagle staff understands Greek Life is a cherished culture on campus. EI, however, undercuts the fabric of legitimate campus fraternities. Our staff implores fraternities to distinguish themselves from the fraudulent group that has tarnished a respected campus convention. Eliminating EI’s threat to the community is an objective paramount to restoring the safety and security promised to us at AU. The longer we allow this problem to ulcerate on our campus, the likelier someone is to get hurt.